A couple of weeks back, at the #Eat.Drink.Tweet conference, the keynote was delivered by a guy named Rick Bakas, whose claim to fame is that he was the very first Director of Social Media in the wine industry. It was a really great keynote, but how he started the presentation was the part that really stuck with me. He showed us a picture of his grandfather. The only photo he had of his grandfather. It was grainy, and his grandfather was in the back, and you couldn’t really even pick out his features. 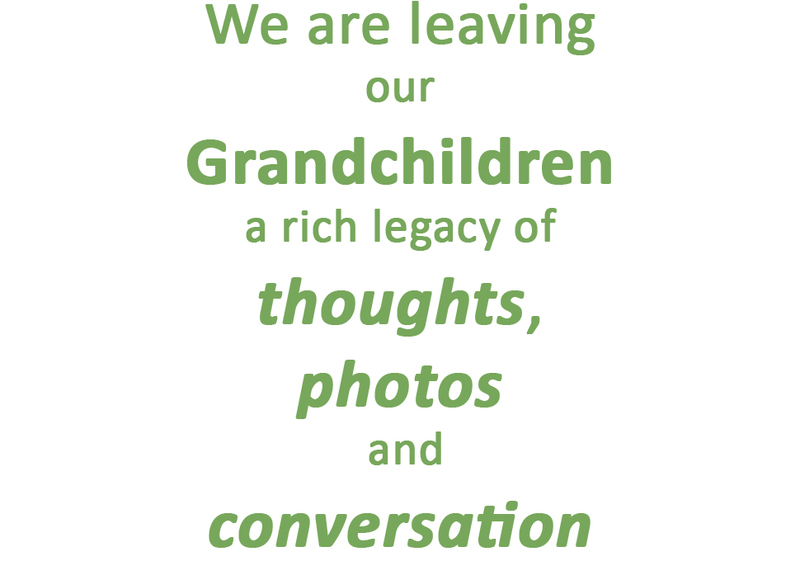 Rick then proceeded to contrast that picture to the legacy of thoughts, photos and even conversations he would be leaving to his own grandchildren via blogs, Facebook, Twitter, YouTube, and Flickr: a kind of cultural curation, he called it. It’s pretty cool when you think about it. My son is growing up in a time where I’ll often hear him say “Hey, Mom, take a picture of this and put it on Facebook.” And he even knows how to do that himself. Part of the reason I am on Facebook is because Michael’s grandparents live on the island, and because we are both on Facebook, I know that any time I post something about what we are up to, or post photos, they will know about it and feel connected to him in that way. The entire Mommy-blogging movement started from that place: creating a journal or a diary for your child, but online, where people who are interested in your child’s growth and development, but don’t see him every day, can play along. There are many, many people who think that this kind of lifestyle is eroding the structure of society, or even that it is downright dangerous. If you include your address on your Facebook page, for example, and then post that you are going out of town for the weekend, you are basically inviting thieves. All the new (and super cool) geotracking apps, like Facebook Places and Foursquare could be bait for a stalker. Beyond that, at the end of the day, do we really give a hoot about what you are having for lunch on any given day? Many believe that we’ve gone too far in the other direction: there is too many people posting about the minutae of their lives, adding to the already overwhelming noise of the interwebz. I often say that social media has saved my life. That might be bit dramatic. Perhaps a more accurate way to say that is that social media has saved my social life. As a single parent with almost no time to socialize (without hiring expensive babysitters–if I can even find one! ), who works from home, but is basically, at the end of the day, an extrovert who loves to be around people, social media is my virtual social life. I don’t think that makes me a pathetic person. It allows me to connect with my friends and for them to connect with me on our own terms–like if I can’t sleep at 4 am. And time and time again, social media has added to my relationships by allowing me to keep in touch with friends I may not see that often, so that when I do see them, the time is more joyful and less awkward. So I will continue to live my life “out here” for a while. And you will probably be the first to know if something happens to change my mind otherwise. How about you? Do you live your life on Facebook, Twitter, Flickr? Has anything scary ever happened to you? Do you feel like Facebook is responsible for the demise of the face-to-face conversation? I’d love to hear. Yes, I live part of my life on Facebook, Twitter and my Blog. No, nothing scary has happened to me, (thank goodness). No. Facebook and Twitter are not responsible for the demise of face-to-face conversation; indeed, I think it stimulates another kind of face-to-face conversation(s). Great post Rebecca and thanks for sharing! I don’t use any of the locator apps or post my location online so I’ve never had to worry about that. But thanks to social media, I’ve made many friends that have developed into fact-to-face encounters. I honestly believe in the power of social media to strengthen connections. And sometimes posting what you eat is entertaining. Toronto Blue Jays player Travis Snider (@lunchbox45) tweets about his meals all the time and even created a meme (#meatsdontclash) which has made him seem more accessible and interesting. I think it all depends on doing it with flair. It absolutely does. That’s a really fun example. I do sometimes tweet about what I eat, but I have a food blog, and also I usually try to give it some value, like trying to drive traffic to my favorite restaurants. What I *don’t* want to hear about is anything to do with the bathroom, thankyouvermuch. I live in Perth, Western Australia, which is the most isolated city in the world (seriously). With so many friends and colleagues living on the other side of the country and around the world, Facebook is the best way to keep in contact with them and all that they are up to. Working in the performing arts, it’s also the best way to keep track of reviews and shows around the traps- plus make vital links with our audiences. Social media is an imperative part of my everyday life! Thanks, Libby. I’m sad I didn’t get to Perth on my trip “down under.” I was pretty shocked at how large your country was, and how vast were the spaces in between cities. Here’s another bonus of social media: getting to meet people in real life that you met on line, and I hope we get to do that some day! I definitely utilize social media to keep in touch, but nothing beats ‘real’ time spent together. With most things, all these devices at our disposal are both good and bad. I can totally relate to what you said about seeing people after a long time without the awkward moments. Social media has kept me in touch and up to speed with my friends in a way that I could never do on my own via phone or (gasp) snail mail. We don’t have to waste precious minutes with basic catch up, because we already have a pretty good idea of what’s been going on with each other!